When I read that passage from Rumi (Wikipedia entry here,) I feel like I can let out a long breath, and relax. What a wonderful time to be away from the political squabbling and angry rhetoric at home. Respites are brief, because the angst and irritation lives in my head. The pundits, bloggers and internet commenters are offering me a gift, and I'm choosing to accept it. Why do I do that? I'm not escaping it by being out of the country either, since Al Gore's Internet has followed me, dangit, and its siren's call has its way with me. As I laid in bed last night I had an impulsive thought: "I need to take a break!" I'm on perpetual vacation, for criminy's sake. A break from what? That might be a good question to ponder. On a happier note, ponder these photos! I can't help but smile when I see this kid's face. A funny older guy put him in this he-man pose since he's so beefy. Yeah, he's a tough guy, you can tell! The shore line of Santa Cruz, taken from one of the restaurants. Guatemala is a country of have and have-nots, but here's one extreme. This helicopter ferried in some friends of a wealthy foreigner. This, in a country where the minimum wage is about $12 a day. I can't sit in judgment, even though I'd like to. My camera gear is worth close to a year's salary. I'm not doing anything obvious to maintain the wealth disparity, but I'm certainly enjoying the benefits of it. Beautiful late afternoon light. That's the San Pedro volcano in the distance. Fresh flowers in a vase at Liz's house. In the town of San Pedro, at the base of the volcano, I asked this girl and her brother if I could take their photo. The light must be reflecting off a window. "Un Quetzal," he says as I start to take this. No, I'm not giving you money. That's the equivalent of 12 cents. Now HE looks like a tough guy. This is a close-up of his eye in the last photo. Look how clearly you can see me and someone walking behind me. I'm so happy with my 7D camera and lens combo. I didn't think my "travel lens" was capable of such a sharp photo. It's a Canon 18-200 lens, and normally you give up quality in exchange for one lens with a wide range. Most women still wear the traditional clothing of their village, but it's less common among men. Everyone in a village will wear almost an identical outfit. I also think it's funny that this tuk tuk model is a "Bajaj Torito," Bajaj being such an Indian name. The Catholic church in San Pedro. This is Liz's son Myles, playing Frisbee in the church courtyard. We asked a local if that's inappropriate. I remember a Day of the Dead celebration in Guatemala on my first trip here, and seeing tourists standing on top of tombs in the graveyard. We were shocked, but found out that it's really OK behavior. It's hard to know what's OK and what's not. Liz and Myles exiting the church. You can see how rugged the local landscape is in the distance. These kids don't even have iPods, much less iPhones or iPads. In psychology we call this "compensating behavior" because as we all know, you can't be happy without the latest electronics. (Ask your own kids.) They're doing an excellent job of pretending to be happy! 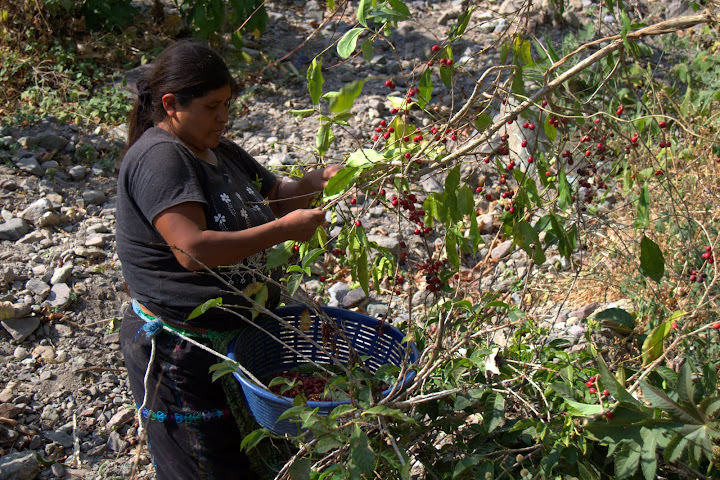 The kids' mom was collecting coffee beans into the basket strapped to her waist. It looked like a labor-intensive task. This house was flooded in the big storm of May 2010. It's just downhill from Liz's, and the normally dry creek was gushing, carrying mud and substantial boulders inside the house and porch area. None of the rocks you see here would have been there before the flood. Liz's house was just high enough to miss being damaged, but the flood completely wiped out the trail that leads to her house. 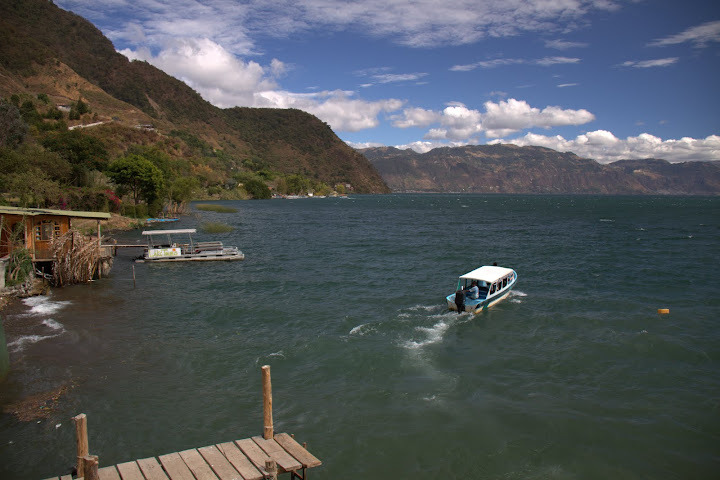 The main road to Lake Atitlan was also washed out for months, and was just repaired recently. This is the lower levels of a hotel. Along with the flooding, the lake rose by about nine feet (almost three meters) in a four month period last year. Many newly built docks were rendered useless, and lots of rocky beaches were immersed. The locals all live way up the hillside, and only foreigners are building properties right on the lake. The lake has gone down some, but if it comes up another nine feet this year, there would be some serious drama for some people.